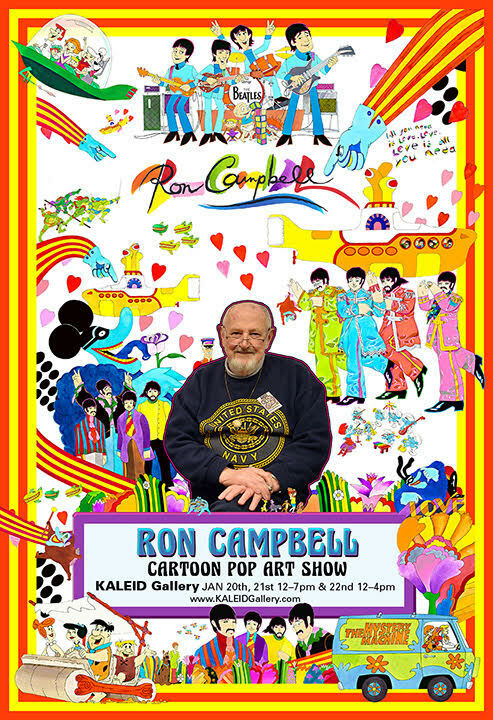 Ron Campbell, director of the 1960’s Saturday Morning Beatles Cartoon series and animator of the Beatles film Yellow Submarine will make a rare personal appearance at KALEID Gallery, 88 South Fourth Street, in downtown San Jose, CA, Friday, January 20th through Sunday, January 22nd. Ron will showcase his original Beatles cartoon paintings created specially for the show and create new Beatles pop art paintings at the exhibit. Ron will also feature other artwork based on his 50-year career in cartoons including Scooby Doo, Rugrats, Smurfs, Flintstones, Jetsons and more. The exhibit is free admission and all works are available for purchase. Ron Campbell will be offering for sale original cartoon paintings of the Beatles both in their ABC Cartoon and Yellow Submarine roles as well as various other works from his 50-year career in animation including Scooby Doo, Smurfs, Rugrats and more. Ron Campbell was the director of the legendary Saturday morning Beatles Cartoon series that aired on ABC from September 25, 1965 through April 20, 1969 and animator on the Beatles film Yellow Submarine. The Saturday Morning Beatles Cartoon series received monstrous ratings in its time slot….a 67 share! It continually fueled new music to the young kids of America as they followed the bouncing drumstick to each Beatles tune. Campbell also wrote the forward to the definitive book on the Beatles cartoon series “Beatletoons.” Yellow Submarine, recently celebrating its 48th anniversary, has become a permanent fixture in pop culture, defining the psychedelic 60s for generations to come. In his book, <em>Up Periscope</em>, Yellow Submarine Producer Al Brodax gives Ron Campbell a great deal of credit for saving the movie and tying it all together at the last minute.